In this painting, the balanced, serene figures are described simply and naturally. A lucid geometry organizes the composition, from the pyramidal grouping of the Madonna and Child to the geometric idealization of their faces and bodies. The deep, blue arch of the Madonna's silhouette encloses the figure of the Child and frames the book, which is further emphasized by the touching hands that hold it. The inscription in the book introduces the ninth hour, or Nones of the Canonical Offices, recited daily by all monastic communities. The Nones commemorates Christ's Crucifixion and Death. With eyes turned to heaven, the Christ Child contemplates His own sacrifice as man's Redeemer. 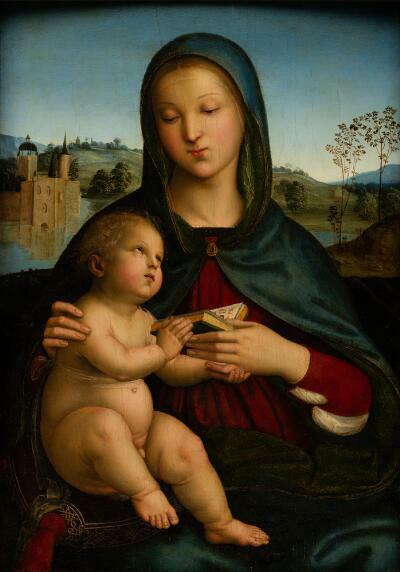 Raphael has depicted more than just a beautiful image of the Madonna and Child -- he has created a meditation piece. The profoundly spiritual quality achieved by Raphael explains why his Madonnas were in such high demand. Raphael was only about 19 years old when he painted this Madonna and Child. But his legendary genius for making all elements of a composition harmonious and meaningful is already apparent. As if endowed with some innate sense of order, the robes of the Virgin have arranged themselves into a triangle, bringing great stability to the picture. Yet nothing is static. A calm, graceful energy seems to flow through the figures, uniting Mother and Child in an unbroken circle of gestures and glances. On the right, the movement springs upward as Christ gazes at his mother…. Then it flows down her mantle, and sweeps around her elbow …only to build again with the rising curves of the child’s knees…. At the center of the composition is a volume of daily devotions. It’s open to the prayer for the ninth hour of the day—you can just make out the first three letters of the Latin phrase Ad None, “at nine,” a meditation on the Crucifixion and death of Christ. Notice how the child seems to pull Mary’s hand and the book towards him, as if already foreseeing and accepting his fate, and looking up to comfort his mother. In his paintings, Raphael epitomized all that the Renaissance held most dear -- harmony, grace and nobility of spirit. Even in an age when many died young, his death at age 37 was deemed a catastrophe.